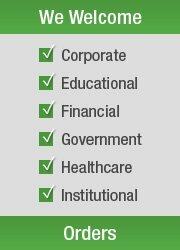 The Printed Table Cloths Feature Multiple Colour Choices for your Business! Full Colour Printing of Graphics! Printed table cloths have different colours of drapes available to choose from to best suit your business. Red, white, black, and blue can be chosen in order for your company to get the best complement for your decor. 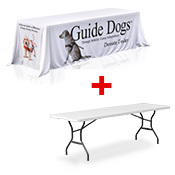 These printed table cloths create a professional looking table for any location. 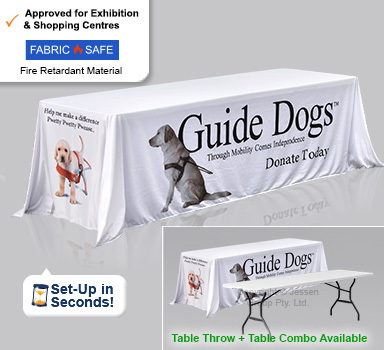 These promotional table covers, printed table cloths utilise a dye-sublimation process to digitally print your graphics onto the throws. This style of printing means your graphics will be in vivid, full-colour to really capture the attention of passersby. The tablecloths fit onto 2438 x 762 x 737mm standard sized tables, working well with ones that have been damaged, as the scuffs can't be seen. 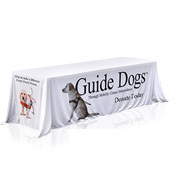 Table drapes, promotional table covers, and other printed table cloths are made of of polyester, providing a durable fabric that will last for years to come. This fabric is also flame retardant and machine washable, allowing the display to safely be used multiple times. The throws cover all (4) sides of tables, allowing for storage underneath without being seen! The coverings are used in many locations as an effective marketing tool. 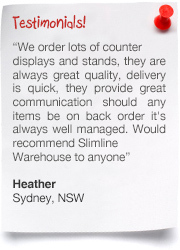 Retail stores, conference centres, and exhibition halls can use them to greet customers and place merchandise. Job fairs and universities lay out brochures and important information for visitors to bring home with them. 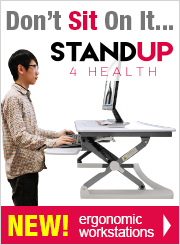 Purchase now! 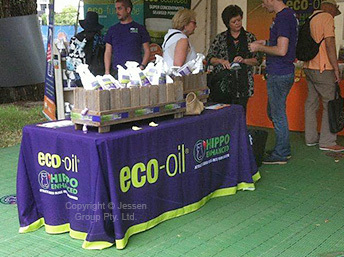 Promotional covers for tables have different sizes and colours to choose from to offer a choice to our customers. 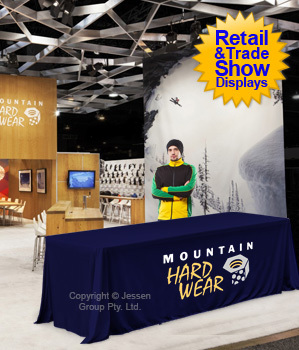 The polyester fabric displays have multiple colour options to choose from with the solid full colour options, and when combined with custom printing, create a memorable display that will gain attention. The coverings are a great addition to any marketing scheme, with the digitally printed graphics on throws for tables being a best bet to have your products shown in a vivid manner. 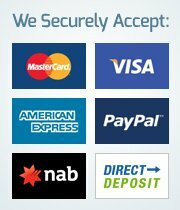 Use the custom made covers today! 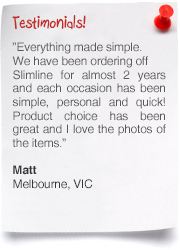 The online catalogue is home to all of our products, easy to browse through to get the right item for your needs. 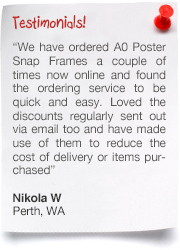 From clip frames and notice boards to brochure holders and standoffs, there is sure to be something within that will help your business. 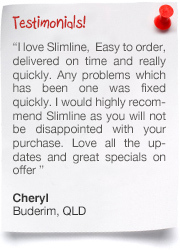 Slimline Warehouse has been a leading purveyor of fine goods for a number of years. 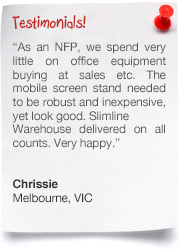 Our warehouse despatches daily Australia-wide, including to Melbourne, Sydney, Perth, Brisbane, Adelaide, & Hobart!